Moong Dal Khichdi (Kitchari) is a simple dish made with rice and lentils, tempered in ghee with cumin seeds. This is also referred to as Pongal in South India. This recipe is to prepare Khichdi in Instant Pot or Pressure Cooker. It takes 20 minutes or less and is a perfect comfort meal for weeknights. Khichdi is very light and easy to digest, hence it is a popular meal during an illness. It is also one of the starter foods for babies for the same reason. However I love to have this khichdi on other days as well to get a break from spices and have a simple comfort meal. Many khichdi recipes have onions and tomatoes added to them, which I would refer to as Masala or Vegetable Khichdi. You can check out recipe for that here. This one is a simple khichdi with just lentils and rice. People prefer variations of khichdi. Usually khichdi is cooked in double the water than what you use to prepare rice and has a runny consistency, however you can vary the amount of water to get your desired consistency. Khichdi or Kitchari is served with yogurt, pickle and papad. Don’t hesitate to top with a spoon of ghee to get the real flavor! Update: I am very excited that this Indian favorite was recently featured on NPR. See the post “Khichuri – An Ancient Indian comfort dish with a Global Influence”. 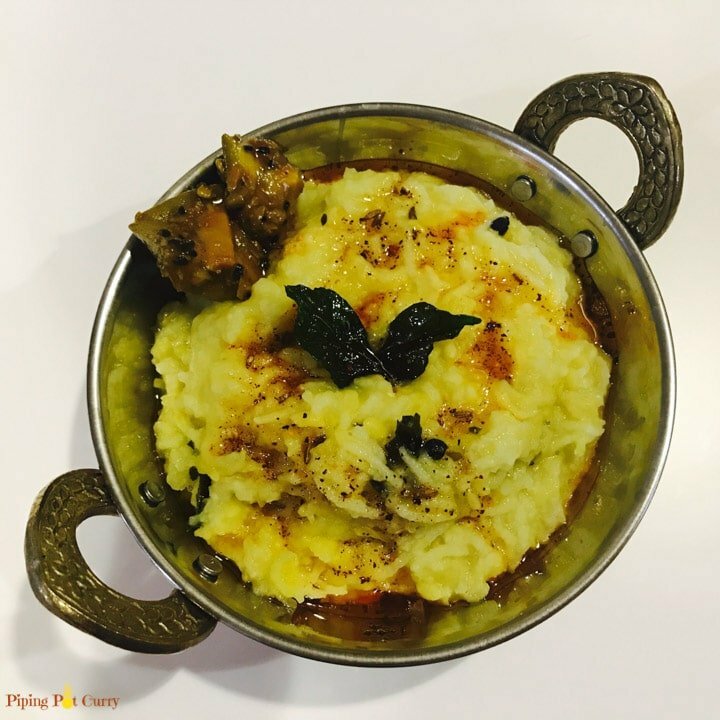 How to make Pressure Cooker Khichdi or Pongal? I have used Split Yellow Lentils to make this khichdi. Khichdi can also be prepared with Split Green Moong dal. As I wanted to make this a one-pot recipe, I added the tempering before rice and dal. Khichdi is best prepared in Ghee or Clarified Butter. You can make ghee in your instant pot using the recipe here. 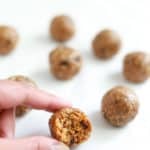 To make this recipe vegan, use your favorite plant based oil. Heat ghee in the instant pot in sauté mode. Add cumin seeds, asafoetida, black peppercorns, curry leaves, ginger and green chili. Once the ginger has changed the color to golden brown, add in equal quantities lentils and rice. 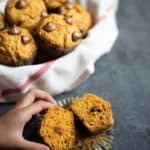 I used half cup each in this recipe. Add 4 cups water. Stir in the salt and turmeric powder. Change the instant pot setting to manual mode for 5 minutes. When the instant pot beeps, the khichdi will be ready. Optionally add tadka or tempering if you like. In this case, I just added ghee and half a teaspoon of red chili powder to prepare the tadka. You can also replace with just a dollop of ghee. Enjoy Khichdi with mango pickle and yogurt. √ It is real comfort food. Don’t forget to top with lots of ghee. √ You are sick and need to have something light. √ After a weekend of eating outside, you want a detox meal. So don’t wait and give this Khichdi a try! Moong Dal Khichdi or Pongal is a simple dish made with rice and lentils, tempered in ghee with cumin seeds. 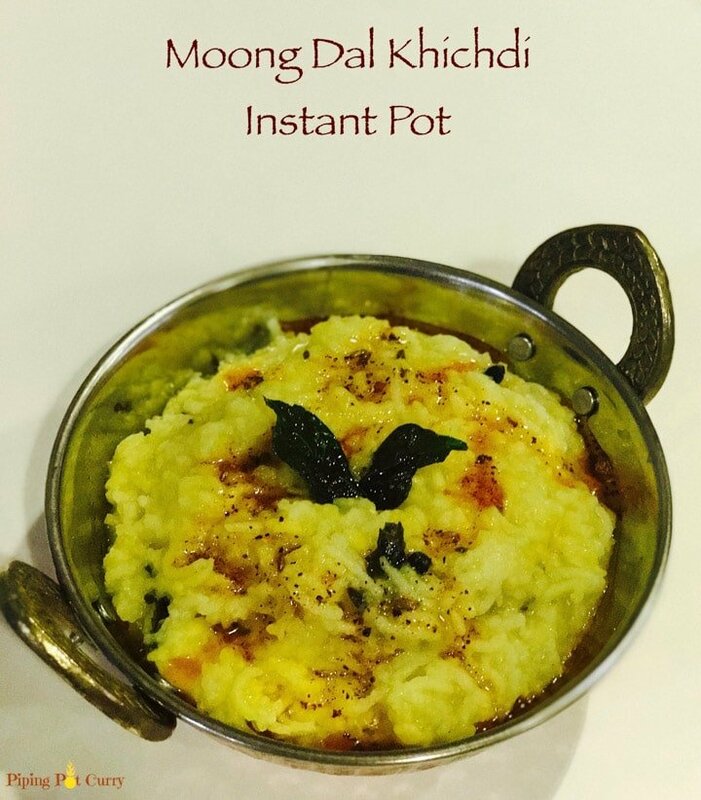 This recipe is to prepare Khichdi in Instant Pot or Pressure Cooker. Start instant pot in sauté mode and heat ghee in it. Add cumin seeds, asafoetida, black peppercorns, curry leaves, ginger and green chili. When the ginger turns golden brown, add rice, moong dal and water. Stir in salt and turmeric powder. Close lid with vent in sealing position. Change the instant pot setting to manual or pressure cook mode at high pressure for 5 minutes. (optional) For tempering, heat ghee in a small pan and add the red chili powder to it. Add it on the cooked khichdi. To make this khichdi vegan, replace ghee with oil of your choice. Khichdi typically has a porridge like consistency. If you like a dry consistency for your khichdi, add less water. Hi I made this with the 4 cups of water in the recipe and it was too liquify.. perhaps brave I soaked the dal and rice before? 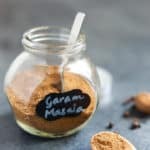 Hey Gopi – Soaking could make a difference for sure as the dal and rice soak in water. I do not soak when making khichdi. Please adjust water quantity to your taste. Thank you for sharing back your experience. 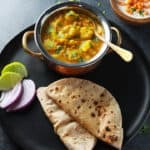 Would I need to make any changes to the recipe if I use brown masoor dal instead of moong dal? Hey Kiara – I have not tried this khichdi with masoor dal. Here is what I would try – Soak masoor dal in hot water for 3 hours (as it is whole lentils, it needs more cooking time so we will try to compensate by soaking). Then follow the recipe as is. Please do share how it turns out. Thanks! Any changes when using split green moong daal? Hey Hilary – I am happy to hear you are enjoying the recipes and want to try them. I usually get my spices from the Indian grocery store nearby. However recently I have got some from Costco (turmeric, cinnamon). I also see all the Indian spice brands available on Amazon, you can find the links on the recipes. Otherwise, Penzeys spices has been very popular in the instant pot groups. Hope that helps! I tried this recipe (with white basmati) and it came out great! Now, I want to try it with brown rice…. have you tried brown rice khichdi? How much pressure cooking time would you recommend? 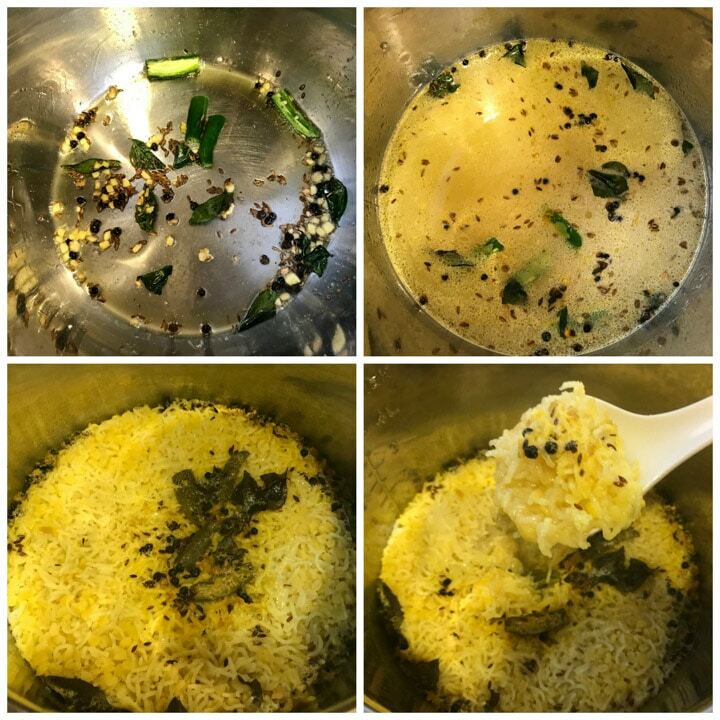 Hey Priya – Happy to hear that you liked the Moong Dal Khichdi. For your question about making this khichdi with brown rice, I am not sure it would work as well. The reason being brown rice takes much longer to cook and in that much time the moong dal will turn to mush. Other lentils that take longer to cook could work better with brown rice, such as chana dal or masoor dal or split moong lentils. If you try, soak the brown rice in warm water for 3 hours. Then pressure cook at high pressure with the lentils for 12 minutes, follow with a NPR. Hope that helps! This looks really good!!!! I have been sick for over a week with a bad head cold…wish I had seen this earlier but going to make it for sure.!!! I am going to try your pongal tomorrow as my first Instant Pot recipe … I will let you know tomorrow how it goes! Well, I tried it, and it tasted very good, but I did not get the pongal texture. I have a feeling that it was because I was using the wrong lentils. I didn’t have moong dal – only chana dal. What do you think? It ended up watery. The other possibility was that I didn’t have the instant pot on high pressure – I will have to look into that. My instant pot is new so I don’t know all the ins and outs yet. Hey Laura – I agree with you that you did not get the pongal texture as the lentils were different. Chana dal also takes longer to cook, and has a very different taste then moong dal. You can set the instant pot on high pressure by pressing the Pressure Level button, which will change between high/low pressure in the DUO series instant pot. Do try it with split moong lentils and let me know how it turns out. I just got the IP and am trying out different recipes. Thank you for this recipe. Is it 5 minutes of high pressure or low pressure? Hey Priya – Congratulations for the new Instant Pot! The default is high pressure. I will update the recipe to mention that. About how long does it typically take for the Natural Release? I’m pretty new to the Instant Pot and I’ve had more IP fails than I’d like. Thanks! So much better this time! Thank you!! Glad it worked out! 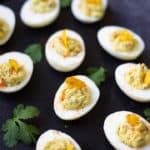 Let me know if I can help for any other recipes. Can you tell me how this differs from Pongal? Hey Beth – Great question. This is the same as pongal. The difference is nomenclature, north indian’s would call this Khichdi and South Indians would call this pongal. I will add that to the recipe post ??? ?